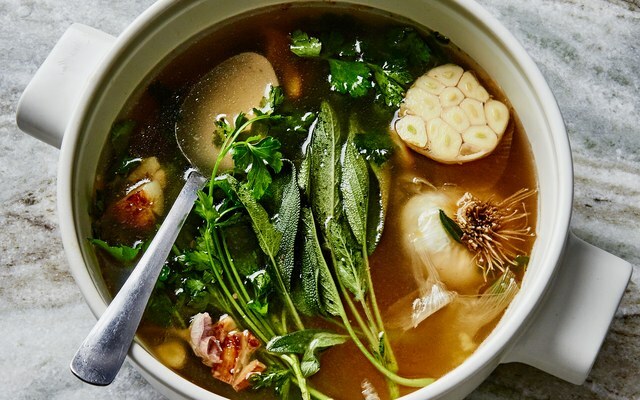 Creating a simple and flavourful immune boosting broth is as easy as simmering whole garlic. 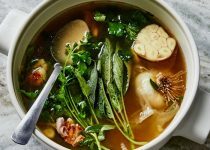 If you have home-made chicken or beef stock, replace it for the water. Start by heating 2 tbsp. extra virgin olive oil in a large saucepan over medium heat. Add 1 head (6 cloves) worth peeled cracked garlic cloves and cook, tossing them around occasionally, until they are golden brown all over 8-10 minutes. Add 2 quarts of water and bring to a simmer. While water is heating, grab a handful of fresh herbs (parsley, cilantro, sage or scallions) if you have them, and add to pot, along with 1 more head of garlic ( 6 cloves) halved and crosswise. Gently boil until broth is reduced by about a quarter and garlic cloves are super soft, 30-40 minutes. Season with salt and pepper. At this point you can strain the broth or pass a wide slotted spoon through it a few times to fish out the garlic and herbs. Sometimes you can add cooked noodles to it, drizzle in some whisked eggs to make stracciatella, float toast on it (rubbed with even more raw garlic) or just sip it as is.